Almost 300 judges from all around the world answered the survey the Exemplar Team presented some weeks ago. Thank you very much! Let you (all judges) evaluate nominations as we (the Exemplar Team) do. See if our expectations line up with the communities when applying the same criteria. When facing a nomination, you were presented two options: ACCEPT, that means it meets all the criteria we use when evaluating nominations, and it would be included in the wave. And DEFER, which means it does not meet all the criteria. So, after that short introduction, here are the results!! 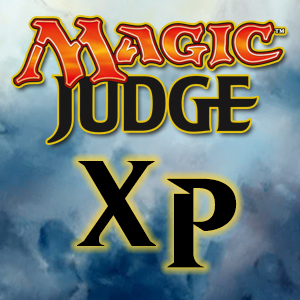 I’ve been continued to be impressed by your leadership and community management skills in judging at your local store.This has involved you engaging and educating new players as well as taking responsibility for giving rulings in a format rife with complexity. You are always eager to learn and willing to use the resources at your disposal for the benefit of the community you have nurtured. As such your commitment to community leadership is exemplary and I hope it continues to grow from strength to strength. 64.1% of the judges would accept this nomination, while 35.9% would defer it. This is similar to what the Exemplar Team thinks. We would accept this nomination, as it contains attitudes that we want to see in judges. It’s a little light on specifics, but the overall package is something we would like to see more of. I want to thank You for the continued participation in all types of online communication. Your more then 10 years of experience helps other judges to significantly improve themselves. A majority of judges (83.4%) would defer this nomination. And we would also defer this nomination. This nomination doesn’t pass the ‘Specific’ criteria we have for nominations, and we need more information in order to accept it. Reviewers are left having to infer what the nature of the participation is. The nominated judge has probably done a very good job in some aspect of online communication, but we don’t exactly know what the judge has actually done. During day 1 of GP Sevilla 2018, there were some zones where there weren’t any judges, mostly because the floor plan was not shared with the teams. You arrived to the venue a couple of hour earlier than the start of your shift, and as soon as you noticed this problem, you put on your shirt and started helping out with calls in the aforementioned zones. Thank you for your help! This is the first nomination the Exemplar team and the community differ on. 66.2% of the judges would accept this nomination. However, the Exemplar Team would defer it. The main reason is that this nomination is basically for working more hours than scheduled. In spite of the fact that helping a tournament is something positive, nominating judges for working more hours than scheduled sends the wrong message to Tournament Organizers and whole community, and that message is that we want them to do that everytime. Here we have a small majority (52.8%) that would accept the nomination. However, the Exemplar Team would not accept it. The reason is because the nomination is mainly for judging events. The quantity of events a judge works is between the judge and the Tournament Organizer. Having to travel far, should be a consideration when negotiating compensation for the event. If a fair compensation is reached, there is nothing particularly significant about travelling. At GP Sevilla, there was a situation in which two players had a heated exchange near the feature match area, and one of the players was clearly shaken after the interaction. You immediately stepped in, and did what you could to make that player feel comfortable and listened to, and really helped keep a volatile situation under control and kept it from spilling over further into the day. The player who was shaken in the situation mentioned that they appreciated how you handled things, and that your intervention helped prevent the encounter from escalating even further.Not a lot of people can quickly interject into a situation like that and can calmly take control and de-escalate things like that, and I really appreciate your efforts in trying to make that player feel like they were listened to and respected. This nomination talks about a great action, so we would accept it without any doubts. And the same thinks the community. 98.3% of the answers would accept it, so you also think the nominated judge did something actually exemplar! [Bryan’s Thoughts] This is exactly the sort of thing that we want to see in judges. The 1.7% that deferred this might have done so because they thought “This is what I expect judges to do, there is nothing special here”. Yes, that true, we do expect judges to try. However, trying is less frequent than we would like, and succeeding is even less frequent. We want to encourage it when we see it. Mentoring is sometimes something difficult, and by mentoring other judges we help them growing as a judge. So a good mentor is something we would like to see at all events. So we would accept this nomination. 83.4% of the judges would also accept it, so we agree again! [Bryan’s Thoughts] This is exactly the sort of thing that we want to see in judges. The 16% that deferred this might have done so because they thought “This is what I expect judges to do, there is nothing special here”. That true is somewhat true, especially at the higher judge levels, but quality mentorship, where the mentee truly gets something out of it, is rarer than we would like, so we want to encourage it when we see it. I can’t simply express with words how much you rocked at GP Orleans doing kickstarter. You’ve been awesome!It was the first time for you, nobody really had time to brief you properly. You followed us and you reverse-engineered our actions to understand what to do, till the point where you were completely autonomous.I was surprised by how quickly you’ve mastered the process, you were always ahead and I could always count on you. Furthermore, you provided feedbacks and suggestion for improvements to the whole team, which turned out to be useful.I really appreciated your suggestions for me on diplomacy with other people at the tournaments. I had some difficulties communicating properly with some other members of the staff, and you kindly explained to me how to be better understood and heard. I did follow your advices, and it worked perfectly. Thank you very much! What else can we ask for a nomination? We have a person that proactively learned a task, rather than waiting to be taught it. They gave meaningful feedback on process improvement, and helped mentor a peer. We would accept it, same as judges who answered the survey (86.6% would accept it). Since I became Area Captain and Judge Manager, I have had to take on a lot of new responsibility in terms of scheduling judges, and coordinating judges throughout the area. I could not have done that without the exemplary work you have done as Judge Manager before, as well as the work you’ve done to mentor me and work with me as we figure out schedules together. Two occasions in particular stand out. First, in the lead up to the most recent prerelease season, when we were both scrambling to make sure we had the right judges for the right schedule spots, you made time to revise your own schedule again and again to make sure both of our stores got the best possible coverage. You also gave me invaluable advice as I took on this new role. Secondly, when crossed communication wires led to an event not having a HJ three days before it was scheduled for, you not only went to Herculean efforts to find a judge, but you also worked with me to identify where the communication breakdown happened, and to take steps to fix that. You made the necessary changes in a diplomatic way, that left the local magic community a lot stronger without any hurt feelings. Great job. Again, a very specific nomination, giving specific examples and situations that justify it. The nominated judge did a very good job both as Judge Manager and Area Captain, and trained his successor so that he could continue the task. Mentoring and working for the community is something we like to see in judges, so we would accept this nomination. Same as the community, with an 85.5% of the answers positive. A vast majority of the judges who answered the survey would defer this nomination (84.1%). We would also defer it, but the team was a bit divided on this nomination. Some of us think that we need more information to accept it. The nomination seems very vague, and requires the reader to guess to fill in the gaps on what was actually done. Some within the team think that, even though it’s short, it contains enough information, since it seems that the Head Judge wrote a very good report from the tournament so that it was very useful for other judges. As you can see, sometimes we also have different opinions on one same nomination. As usual, your solid support during GP was one of the biggest things that got us through the day without any major mishaps, despite having several new judges on the floor. Your knowledge, experience and the efficient and reliable way with which you see tasks through made you an MVP in this event. This nomination is very vague. We need more information to accept it. It seems that the nominated judge actually did a very good job at that GP, but we can’t actually identify it. By just reading the nomination, we can see things that almost all judges do while judging at GP’s if they have been around for a while. In this kind of nomination, we ask the judge that wrote it to write it again during the following wave with the additional information (the nominated judge would have an additional spot to do that). This nomination is what can be thought of as a trap. There are lots of positive words in it, ‘solid support’, ‘knowledge’, ‘experience’, ‘efficient’, and you finish the nomination with a positive impression. However, when you go back and re-read the nomination, you struggle to find anything discernible. Judges who answered the survey think the same as the Exemplar Team: 80.3% would defer it. I would like to recognize your dedication to the regional competitive Magic scene. I often find you double-booking your weekends and travelling pretty far to ensure that events can happen in our area (despite a decidedly lacking L2 population). Thank you for stepping up to the plate to make sure that the players in our area have plenty of chances to compete and options on where to do so. Judges answering the survey were completely divided with this nomination. 50.7% would accept it, and 49.3% would defer it. The Exemplar Team has no doubts in this kind of nominations, and would defer it. Similar to nomination #4, judging events is something between the TO and the judge, so if they agree on terms and compensation there’s nothing significant on it. We don’t consider judging frequently particularly relevant or praiseworthy. It just is. We do value what you make of yourself and the events in the frequent opportunities you create for yourself. At Nationals this year you were the only L3 on the floor, and you had to ensure that all of the calls on the floor were being handled correctly. Even with this responsibility, you still found time to check in on the Team Leads, and provide feedback/suggestions for us during the day. You particularly ensured that we were thinking about the whole team – including those over at sides. I really admire the consistent focus you have on the wellbeing of the judge team – emotional and physical. It can often be easy to focus so hard on our tasks that we forget about making sure everyone on staff is doing okay, and every single time I judge an event with you, you always have time to make sure everyone is having a good day.Thanks for being awesome, it makes judging better. You are the most active Judge in your Area in terms of number of events judged. You are always happy to provide players with correct rulings and excellent customer service. We often forget how important it is to have Judges like you who hold the lines and make sure the game we love keeps going. 74.1% of the judges would defer this nomination, which is the majority of the judges who answered the survey. The Exemplar Team agrees, but there were different opinions, similar to question number 9. In this nomination we have something not significant (frequently judging events) combined with something expected (correct rulings) and something potentially exemplary (good customer service).However we need examples or a description related to the customer service in order to accept the nomination. GP Sevilla 2018 was perhaps the biggest challenge in your judging career thus far since it was your first GP wearing black, as part of the judge staff.Both on Saturday while you were on on-demands, and on Sunday during the PTQ you were caught in the middle of a cultural clash between foreign judges who did not speak Spanish, and Spanish judges who spoke little to no English.As you correctly identified, this was driving the two groups away which made some judges feel pretty bad, especially the less experienced local judges who were working at their first GP ever and had been very excited to meet some new judges.Your efforts in cheering up, motivating and attempting to mend this situation were outstanding and went through many judges including myself on ODEs, your team lead on Sunday and ultimately the CFB side.Not only is this something that most people would not, and did not pick up on, the sensibility and maturity you showed during the entire weekend are qualities that I am very glad to know are flowing within the Judge Program. I know this was something that upset you at your first GP as a judge but I really do hope that my words and the words from many other judges who have reached out to you since will motivate you to keep wearing the black shirt. This is something that goes beyond what is expected from a judge. The nominated judge found an issue that was affecting other judges’ feelings, and acted in order to solve this issue, in a way that everyone could benefit from the tournament. So this is a very very good nomination, and we all agree that we should accept it. The Exemplar Team has no doubts about it, and you also don’t have many doubts (89.3% would accept it). In Blanes, you set a priority on mentoring, and it made a huge difference for me the whole weekend. I got to have multiple long conversations with you and other L3s about everything from policy to receiving feedback to making events exceptional, and it was one of the most fantastic learning experiences I’ve been able to have in the judge program. Beyond that, every day, you greeted the team with a smile and a kind acknowledgement of us as both judges and people, and that really set an excellent tone for the event. I felt supported as a judge because of the work of everyone around me, and supported as a human being because it was clear from the moment I walked in that you cared about us and were there to help. Your demeanor and philosophy in leading, especially on sides, is truly amazing, and leads to some excellent events and happy, supported judges. Thanks for being awesome! Again, we find a very good nomination. It combines good mentoring to other judges, with making events better to all staff, all combined with specific examples, … By reading this nomination we all know what the nominated judge did during the weekend, so we would accept it. And 80.3% of the judges who answered the survey also would accept it. You did one of the kindest things I have seen. After watch all the judges at GP Venice work their butts off you came in the next day with many snacks to help the judges recharge. This type of attention to the people in the judge program is amazing and I want to see it continue. Thank you for your dedication to judges and their well being! These types of nominations tend to be contentious. In this nomination, judges who answered the survey were divided (53.4% would defer it against 46.6% of judges that would accept it) similar to the Exemplar Team. Some us think that this is a something that we want to see in judges at big events, since it motivates other judges to do their job (so some of us would accept it), while some of us think that this is something clearly good but a rather low bar for Exemplar, and while a nice thing, is not a nice judge thing not actually related to judging, and it’s more a Tournament Organiser issue, it’s something that the Exemplar Program should not take into account. Finally there were more votes for deferring the nomination rather than accepting it, but we were really divided on this one. Again, sometimes things are not as easy as they seem. Your inclusion on my project has been one of the best things that has happened to it since I came on. Recently we were genuinely struggling to make sure we could keep our schedule and not miss a week. When I communicated this to you, you turned around an interview so fast it made my head spin. Not only that, but you worked with another Judge to come up with another 5 weeks worth of material. This project succeeds on the backs and shoulders of outstanding self-starters who put in the time and effort to recognize the many people in our community that make the program shine. I leaned on you heavily and you came through. Thank you! And finally a nomination for working on projects. Working on projects is something that many judges do, since our community is based on those projects and they are necessary for the community. But this nomination is not just for working, this nomination is for going beyond that point. Sometimes a project needs fresh air in order to continue and not disappear, and sometimes a project needs a judge that participates hard in order that it can continue helping the community. We want to see judges contributing in a positive way in projects, so we would accept this nomination. And a 90.3% of the judges who answered the survey would also accept it. We hope that you enjoyed answering the survey and reading the analysis we prepared for you. Putting yourself in the mindset of the reviewer can give you insight into how we look at things. We hope that this has served to understand better our task reviewing nominations. See you in the next survey!! !